If you know the name Anton Schwarzkopf then you are a coaster enthusiast. Anton Schwarzkopf is probably the most pioneering ride designer in the early days of the steel roller coaster industry. His company installed 147 roller coasters at parks around the world and also supplied many traveling coasters to fun fairs as well. Schwarzkopf’s company installed the first modern steel looping roller coaster at Magic Mountain called Revolution. He is also credited with designing the first launching rollercoaster, unlike the modern counterparts it inspired, it was powered by dropping a heavy counterweight to power the launch. At Lagoon in Farmington, Utah they have a Schwarzkopf double looper called Colossus the Fire Dragon. It began life despite its size as a traveling coaster with a German fair operator in 1981. It was permanently installed in Utah 1983, as one of only two double looping Schwarzkopf coasters in the world. The other was very similar in layout and was called Laser at Dorney Park & WIldwater Kingdom. 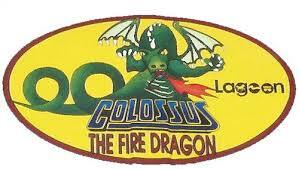 Laser was closed down in 2008, so Colossus the Fire Dragon is the lone surviving double looper. It has become a favorite to many at Lagoon for its extreme G’s during the loops and strong lateral forces. It also is praised for its comfort and freedom only requiring riders to wear lap bar restraints. The omission of OTSR is a welcome sight for many coaster enthusiasts on Colossus the Fire Dragon. Riders begin their 1 minute and 45 second ride climbing the 86.9 foot tall lift hill. The train slowly turns to the right and gracefully dives down the main drop reaching speeds of almost 50 MPH. At the bottom of the banked drop the train swiftly enters the first 65 foot loop, immediately followed by the second. Riders experience a punishing 4.8 G’s on Colossus the Fire Dragon. Next the train suddenly turns to the left and enters a helix that climbs up and passes through the center of the second loop. The track dips and the train crosses the layout heading towards the second helix. This time turning to the right it starts spiraling down, but this helix is on a slant so as you reach the other side you are suddenly moving up and then down again as you complete the element. With the train banking low enough to the ground it feels like you could reach out and touch it you are slammed into the brake run. The train returns to the station and riders can escape or dare to try their luck again.